It hurt my heart for her. And it reminded me of the times when I’ve been in her shoes. This event got me thinking. I remembered an incident the week before, when another friend was out-of-town, and her babysitter forgot to pick up my daughter for dance. It wasn’t a big deal because the studio is nearby, and I could take her. Still, my friend felt terrible about the slip-up. She apologized profusely and asked for grace. I told her the same thing: “Don’t worry about it one more second. We are good!” We all make mistakes, and the truth is, I’ve made mistakes similar to both these friends before. I know what it’s like to be on the other side…and maybe that’s why I could respond as I hope they’d respond to me. With a sincere desire to not let the little slip-ups ruin a good relationship. Unfortunately, this seems far too common these days. I believe little slip-ups, tensions, and resentments that build up silently are eating away at relationships. Among women and teen girls (audiences I write for) one cause is an expectation of perfection from our friends. Just as we expect perfection of ourselves (and berate ourselves when we fall short) we expect it from those around us. And when they slip, we get stingy with grace. Pope Francis, with his trademark humility, has defined modern society as a “throwaway culture” marked by disposable relationships. He says we’re quick to say Good-bye, and I agree. Many relationships today have very little loyalty, and given that, it’s no surprise why people get clingy and insecure. We live in an age where people trade in friends like they trade in used cars, replacing dinged up old ones with shiny new ones when they hit an unexpected bump in the road. Expecting perfection makes it easy to write people off. While relationships certainly need standards of kindness, respect, and consistency, they also need grace and forgiveness. Any relationship that lasts long enough will have highs and lows. Seasons you click and seasons you don’t. Learning to respectfully talk things out and love a person even when the feeling fades can help keep things afloat when those low points come. This is how relationships survive. This is how friendships go the distance for 20 years or more. Recently I spoke with a woman who mentors teen girls. She’s planning a speaking event for me, and as she shared the heart of her group, I realized she has a great pulse on their inner lives. The struggles she walks her girls through are the same things I hear about everywhere I travel. This mentor has wisely observed that what begins as an issue between 2 GIRLS often escalates into an issue between 2 GROUPS as word spreads and people takes sides. Someone’s feelings get hurt or they get angry, and rather than talk with the person who hurt them, they talk it out with everyone but that person. This gets everyone puffed up, turning friend groups into gangs. Issues can often be resolved (or partially settled) if the 2 people involved have a calm conversation that’s not an attack. Nobody teaches this life skill, yet they should. In my personal life and in parenting, I’ve seen relationships restored and strengthened when 2 people learn to sit down, hear each other out, listen, and see the situation from each other’s perspective to get the full story. Wow. That’s powerful, isn’t it? Does it give the girls permission to jump each other’s case because they feel salty or on edge? No, of course not. As I tell my daughters, you’ve got to know yourself well and control your emotions so your emotions don’t control you. Just because you’re in a mood doesn’t give you an excuse to take it out on someone. It doesn’t mean you shouldn’t ask for forgiveness when you lose it or mess up. What it does mean is that our friends need grace like we need grace. Our friends need safe relationships they can count on, people who love them unconditionally – even on their salty days – and won’t dump them over every stumble. Relationships are very important to most females, and more than anything, we want approval. That is why we worry so much when we do mess up…because we’re scared of ruining a good thing in this culture of little forgiveness. Chances are, someone in your world will stumble this week. They will mess up and feel terrible, maybe lose a little sleep. As you consider your response, remember the times when you’ve messed up. Call to mind your own mistakes. If someone threw a bone to you, remember that gift of grace. Think of how it felt to realize they wouldn’t give up on you – or think less of you for being human. That’s the comfort people hunger for these days. That’s the security that gets lost in a throwaway culture. That’s what helps a friendship survive and get past the inevitable bumps in the road. 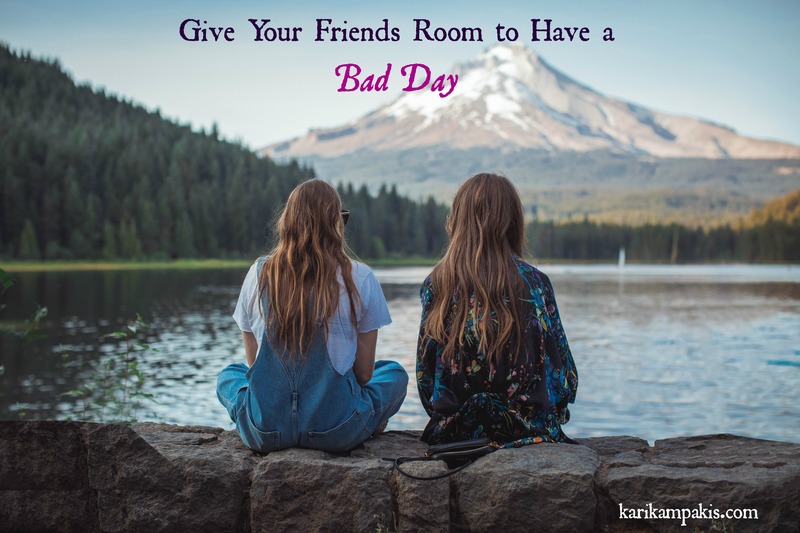 We all have bad days – and we all need friends in our life who allow them. Friends who make us feel okay when we’re less-than-perfect. Friends who can witness our messy truths and love us anyway. That is the friend I want in my corner. And therefore the friend I strive to be. Also, I’ve written two books for teen & tween girls designed to empower them through faith. Both Liked, and 10 Ultimate Truths Girls Should Know have been used widely across the U.S. for small group studies. Finally, I have an upcoming mother-daughter event in Baton Rouge that’s open to the public. If you live nearby, we’d love to see you! On February 6 I’ll be at First United Methodist Church speaking about what it means to live fearlessly for Christ. So bring your daughter or a group of girls and buy your tickets here. As usual Kari, amazing words of wisdom. I look at it this way. I am so grateful I get to forgive. I’m so grateful I have a friend worth forgiving. And I am thankful they forgive me. Blessings and happy new year!